It’s a good idea to have a pet first aid kit to hand in case your pet injures itself while out on a walk or in the garden. Although it can be daunting, it’s best to know what to do should your cat or dog suffer a scrape or injury. You can protect their wound from getting dirty or infected while on the way to the vet. Watch our quick and informative video below with qualified vet Sara Greig, where she demonstrates on Bertie the dog how to deal with a wound. Ask your vet about where to source these items. Using adhesive bandages on your pet won’t work as your pet’s hair will prevent the adhesive from sticking to the skin around the wound. Bandages applied to dogs and cats should (where possible) have several layers and wrap around the affected body part. Wrapping wounds in a dressing and bandages will stop any bleeding and keep the wound safe and clean. This will reduce the chance of infection while you’re on the way to the vet. Start off by putting on some gloves to ensure everything remains clean. After this, rinse the wound in water. This will remove any grit or dirt before applying the bandage. If you have a clean towel, spare dressing or clean kitchen roll, pat the area dry. The next step is to apply the dressing. The dressing will protect the wound and will usually be made of non-adhesive, sterile material. Next, apply the first bandage. This will help keep the dressing in place and will also provide some padding to the wounded area. Next, apply the final layer of dressing. This is the protective layer and will usually be made of a slightly thicker and more durable, stretchy material. The final bandage layer should prevent moisture from entering the wound. However, if you’re on a walk when your pet injures itself, you can attempt to cover the wound with something like a plastic bag to ensure no water or moisture gets in. This will provide some protection while you make your way to the car. 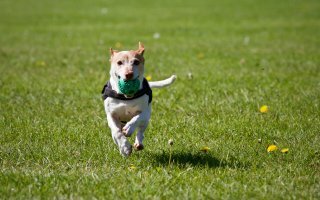 The most likely place your pet will suffer an injury is on its leg. When dressing this type of wound, make sure you include all of the toes and wrap the bandage around the whole leg to ensure the dressing is fully in place. Don’t wrap the bandage too tight as this will cause your pet discomfort. Tight bandages can also cause severe trauma, even after just a short period time. In case your pet suffers a scrape or injury, insure them with pet insurance to make sure they get the best care. Visit our main site at www.argospetinsurance.co.uk for more information on our pet insurance policies and to get a quote. If you’re looking for more advice about your dog, head over to our We Talk Dog blog where you can read more about dog grooming, behaviour and health.